D is the best letter in the world, because it stands for DYLAN – and that’s me! It also stands for Dougall, and that’s my brother. I look after him, of course. He’s always been shy and retiring. Some people find us hard to tell apart but Dougall’s got a white bottom and I’ve got a white chin. Other than that, we’re brown and hairy with a bit of white in the middle. We’re not sleek, we have rosettes in our coats, sort of whirly bits where the hair changes direction. Our dad was probably a Peruvian pig. And we’re three and one third years old. We came to live with Mummy and Uncle Victor when we were three weeks old, and Mummy says she always knew I was going to be trouble. All those early photos with Dougall huddling up shyly to Victor, and me round the back doing my thing or staring at the camera, saying “go on then!”. Hee, hee. I think they look fun. Mummy asked me something the other day. She said “Do you stand on the right with Dougall on your left all the time by accident, or is there some grand plan?” It’s just the way it should be, Mummy. Mummy’s written one short story about us called Dylan’s Yuletide Journey and you can download it FREE at smashwords. She says we’re going to have more adventures and turn up in the last book, or possibly the last two books, and we’re very important. Well, of course we are! We’re the Princelings of the North. I might blog about the place she says we come from in the letter I, because I don’t know anyone whose name begins with I. You’ll have to come back again and see. I hope you do! Well there you go, great bunch of GP’s. Welcome in the letter “D”… thank you! Dylan is darn cute. The neighbors across the street have a single lonely Guinea pig. I think they should get another so she’s not lonely. 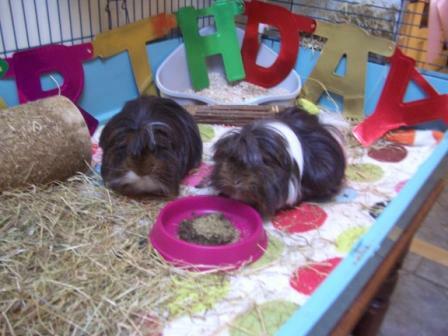 I don’t think I’ve ever been to a guinea pig blog – but that is an oversight now remedied! (I got here from the A to Z Challenge – can’t wait to see more!). I’ve never met a guinea pig who could type before – good work, Dylan! Good luck with the rest of the A to Z! I remember those early days so well. You two looked like a couple of chocolate crumb cakes. You gave Uncle Victor new life and purpose. You came along at just the right time. It was the first time that my Willoughby got to be an uncle. He was only a year old at the time. He was so excited. Dyl, you remind me a lot of Willoughby, and even more of Mariusz. Dougall is more in the Victor/Saku line: gentle, modest, retiring. Did you know that in Peru, they keep guinea pigs, for lunch and dinner. I would not put South America on your list of places to travel.